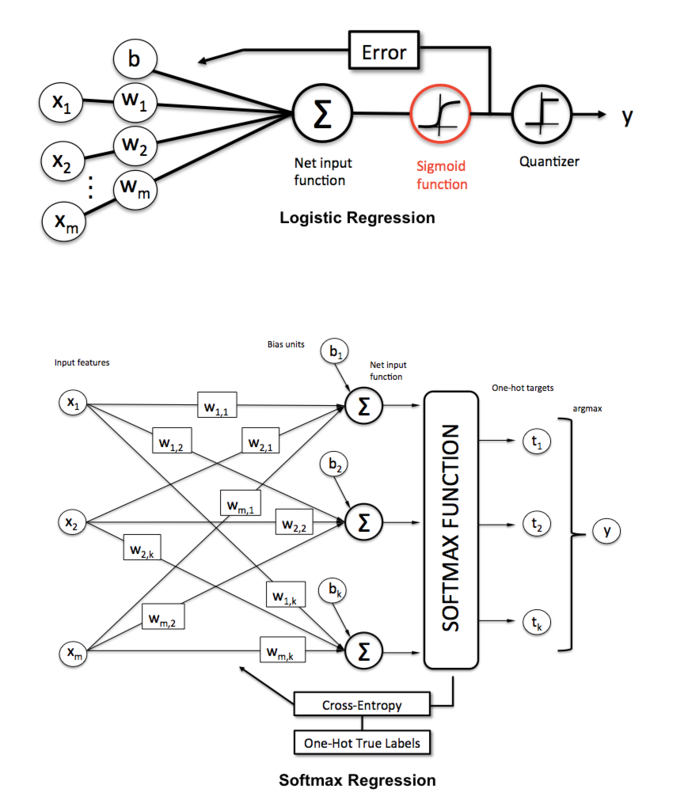 What is Softmax Regression and How is it Related to Logistic Regression? Now, this softmax function computes the probability that this training sample x(i) belongs to class j given the weight and net input z(i). So, we compute the probability p(y = j | x(i); wj) for each class label in j = 1, ..., k. Note the normalization term in the denominator which causes these class probabilities to sum up to one. To illustrate the concept of softmax, let us walk through a concrete example. Let's assume we have a training set consisting of 4 samples from 3 different classes (0, 1, and 2). A sample that belongs to class 0 (the first row) has a 1 in the first cell, a sample that belongs to class 2 has a 1 in the second cell of its row, and so forth. Next, let us define the feature matrix of our 4 training samples. Here, we assume that our dataset consists of 2 features; thus, we create a 4×(2+1) dimensional matrix (+1 one for the bias term). Similarly, we created a (2+1)×3 dimensional weight matrix (one row per feature and one column for each class). To compute the net input, we multiply the 4×(2+1) feature matrix X with the (2+1)×3 (n_features × n_classes) weight matrixW. which yields a 4×3 output matrix (n_samples × n_classes). Here the T stands for "target" (the true class labels) and the O stands for output (the computed probability via softmax; notthe predicted class label). Using this cost gradient, we iteratively update the weight matrix until we reach a specified number of epochs (passes over the training set) or reach the desired cost threshold.